The Vb class is the encapsulation of the SNMP variable binding. Variable binding lists in SNMP++ are represented as arrays of Vb objects. Vb objects are passed to and from SNMP objects to provide getting or setting MIB values. The vb class keeps its own memory for objects and does not utilize pointers to external data structures. Definition at line 88 of file vb.h. This constructor creates an unitialized vb. Definition at line 100 of file vb.h. Constructor to initialize the oid. This constructor creates a vb with oid portion initialized. Definition at line 107 of file vb.h. Definition at line 113 of file vb.h. Destructor that frees all allocated memory. Definition at line 118 of file vb.h. Definition at line 423 of file vb.h. Definition at line 128 of file vb.h. Clone the value portion of the variable binding. a pointer to a clone of the value of the receiver. Definition at line 354 of file vb.h. the length of the BER encoding of this Vb. Definition at line 389 of file vb.h. Check the validity of the object through Vb::valid() before calling this method. Definition at line 143 of file vb.h. Get the oid portion as a const. Definition at line 151 of file vb.h. Return a formatted version of the Oid. A null terminated string (may be empty if no Oid has been set). Definition at line 403 of file vb.h. Return a formatted version of the value. A null terminated string (empty if no value). Return the syntax or the exception status. If the SNMPv2 exception status is set, it is returned. otherwise the syntax of the value object is returned. 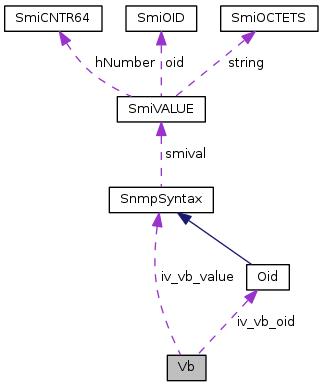 Get the value using a SnmpSyntax object. val - An object of a subclass of SnmpSyntax that will be assigned the value of the vb. SNMP_CLASS_SUCCESS if the vb value could be assigned to the passed SnmpSyntax object, else SNMP_CLASS_INVALID. This method will only return success if the value of the vb is SMI INT32. SNMP_CLASS_SUCCESS on success, else SNMP_CLASS_INVALID. This method will only return success if the value of the vb can be mapped to an unsigned long (SMI types uint32, counter32, gauge and timeticks). This method will only return success if the value of the vb can be mapped to an unsigned 64bit value (SMI type counter64). This method will only return success if the value of the vb is SMI OCTET. The caller must provide a target string big enough to handle the vb string. No length checks are done within this method. The returned string will be null terminated. ptr - Pointer to already allocated space to hold the vb value. The first char will be set to zero on failure. len - Returned length of the string. Will be set to 0 on failure. If the target space is not big enough to hold the complete string only part of the string is copied. maxlen - Maximum length of the space that ptr points to. add_null_byte - Add a null byte at end of output string. status - the new SNMPv2 exception status. Definition at line 383 of file vb.h. Set the value portion of the vb to null, if its not already. Definition at line 215 of file vb.h. Set the oid from another oid. Definition at line 135 of file vb.h. The Value portion of the Vb will be deleted and a new value portion is allocated with it's default value (zero). syntax - The new syntax. Set the value using any SnmpSyntax object. Definition at line 158 of file vb.h. Set the value with an int. The syntax of the Vb will be set to SMI INT32. Definition at line 166 of file vb.h. Set the value with an unsigned int. The syntax of the Vb will be set to SMI UINT32. Definition at line 173 of file vb.h. Set the value with a long int. Definition at line 183 of file vb.h. Set the value with an unsigned long int. Definition at line 193 of file vb.h. Set value using a null terminated string. The syntax of the Vb will be set to SMI octet. Definition at line 201 of file vb.h. Set value using a string and length. Definition at line 209 of file vb.h. Return the validity of a Vb object. TRUE if oid and value have been set. Definition at line 429 of file vb.h. Definition at line 428 of file vb.h.